When you stay at Clarion Suites St George in St. George, you'll be near the airport, within a 5-minute drive of Fiesta Family Fun Center and St. George Utah Temple. Featured amenities include a 24-hour business center, express check-out, and complimentary newspapers in the lobby. Planning an event in St. George? This motel has facilities measuring 1225 square feet (114 square meters), including a meeting room. Free self parking is available onsite. 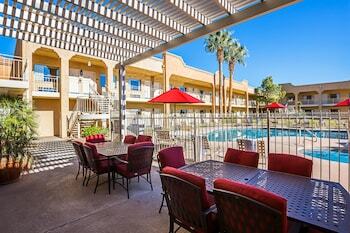 Located in St. George, Claridge Inn is within a 5-minute drive of Fiesta Family Fun Center and St. George Utah Temple. Free self parking is available onsite.